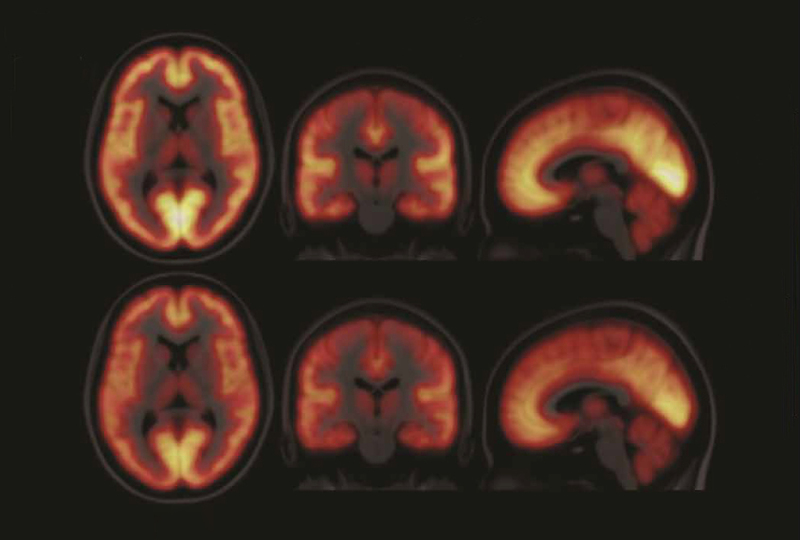 Puzzling results: Brain scans reveal no difference in the density of receptors for gamma-aminobutyric acid between people with autism (bottom) and controls (top). New results from brain scans of adults with autism are at odds with the popular theory that autism involves weak brakes on brain activity1. Some experts say, however, that the scans in the new study are too imprecise to cast serious doubt on this theory. The scans show no difference from controls in the density of certain receptors for a chemical messenger that dampens brain signals. One of the most popular theories of autism holds that too little of this chemical messenger, gamma-aminobutyric acid (GABA), results in too much excitation in the brain. In support of this, several studies have found that autism brains have less GABA or less GABA-A, the most abundant receptor for GABA, than typical brains2,3,4,5. Because of this, several research teams and companies are testing drugs that activate GABA receptors. Most of the studies of GABA-A levels relied on postmortem tissue, however, and included individuals with intellectual disability or epilepsy, or who had been on medications that can influence receptor levels. The new study is one of the first to measure GABA-A levels in the brains of living autistic people. “We find no evidence for differences in this receptor within this particular subgroup of individuals,” says Declan Murphy, professor of psychiatry and brain maturation at King’s College London, who co-led the study. The work was published 3 October in Science Translational Medicine. People with autism do perform differently than controls on a task that requires GABA signaling, the study found. This suggests that GABA signaling is impaired in autism, but a dearth of GABA-A receptors is unlikely to underlie the problem, Murphy says. Instead, other types of GABA receptors might be involved, he says. “GABA likely plays an important role in autism. The question is, how do we target it?” Murphy says. Murphy’s team used positron emission tomography (PET) to detect the receptors. Some scientists say, however, that this technique has a lower resolution than the methods that generated the theory. Murphy’s team injected a radioactive tracer that binds to GABA-A receptors into the blood of 15 adults with autism and 15 controls. Both groups contained 11 men and 4 women. Once the tracer travels to the brain, a PET scanner picks up the radioactivity, which reflects the density of the receptors. The results revealed no differences between the groups in receptor density across the brain. The team also injected a separate group of 12 autistic men and 16 controls with a second tracer that binds to a subunit found in some GABA-A receptors. In a 2013 pilot study, the researchers had found atypically low levels of this subunit in three autistic adults6. In the new study, however, they found nothing unusual in the density of this subunit in the autism group. The team also injected both tracers into three autism mouse models: One lacks the CNTNAP2 gene, another is missing SHANK3 and the third lacks a region of chromosome 16 called 16p11.2. PET imaging again revealed typical ranges of GABA-A receptor density in the brains of these mice. Still, researchers who led the previous studies are skeptical. “You have to look at cells; you have to look at layers; you have to look at circuits,” says Gene Blatt, director of neuroscience at the Hussman Institute for Autism in Baltimore, who led some of the studies. The earlier studies have limitations, too, however. Some of the brains in those studies came from autistic individuals who had taken seizure drugs, which may have influenced their GABA-A receptor levels. Murphy’s team, meanwhile, is exploring the role of GABA-B receptors in autism. As part of a large clinical trial, they are testing a drug called arbaclofen that specifically activates this subset of receptors.